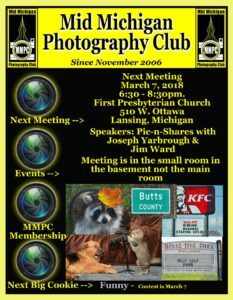 The February meeting of the Mid-Michigan Photography Club is scheduled for 6:30 p.m. on Wednesday, February 7, 2017 at the First Presbyterian Church, 510 W Ottawa St, Lansing, MI. The speaker Michael Wood from The Camera Shop will discuss What’s New in Photography for 2018. The rescheduled Lighthouse Crawl will take place on Saturday February 3, 2018. Please respond to the Facebook event or reply to mmpclansing@gmail.com if you plan to participate. We will meet behind the Cracker Barrel on the West side, in the parking lot of what was Gander Mountain at 6:00 am. The meeting location is South of Saginaw (M-43) off of Marketplace Blvd. Please dress weather appropriate. Things to bring, ice cleats or yaktraxs are a must, proper clothing, tripod, hiking stick, extra batteries. We will stop for lunch and dinner (if you prefer to bring a sack lunch you are welcome to). We will probably stay out for the magic hour and then go to dinner and head home. 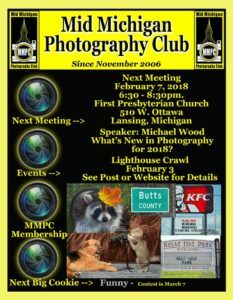 The waiver form is at http://mmphotoclub.com/wp-content/uploads/2018/02/lighthouse-crawl-Jan-2018-waiver.pdf. Please bring a signed copy of the waiver form with you to the Lighthouse crawl. Thanks to all who contributed to the MMPC Photo Challenge in the first month of January. A reminder that the February theme is Ice. If you do not use the Facebook group, send your entry by email to mmpclansing@gmail.com so that we can post it to the Facebook page. Discussion of the photos, beyond simply liking the picture, is encouraged. Members who post in all 12 months of 2018 will be entered for a gift card drawing at the end of the year. The march 2018 Big Cookie theme will be Funny.